Saying that lighting style is a tricky topic for her, Oakley reports that her design firm tries to never lock a design into a specific “style.” “There’s no need to be boxed in,” she says. “The best homes combine farmhouse, industrial, contemporary, traditional—everything—but in a flowing, cohesive way. The experts are all in favor of layered lighting, which generally includes recessed lighting and chandeliers. 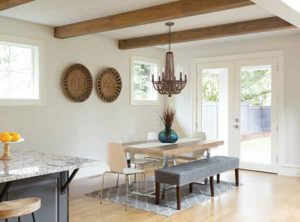 Agreeing that recessed lighting continues to grow in popularity, Dobson adds that pendants have become larger in scale but tend to be clean, open, and airy, as opposed to something visually heavy. Reporting that clients are drawn to lighting as they are to jewelry, Deborah Hayden of DC 7 Designs says, “They want something that feels right for the space and reflects their taste. 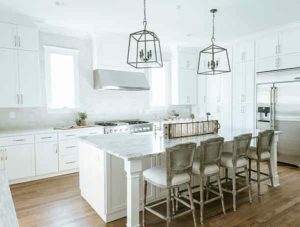 Lighting needs are paramount, so I look for fixtures that serve the homeowner’s needs in a beautiful way.” Recessed lights are being placed more deliberately and pendant and chandelier lighting are beginning to merge in terms of looks and function, she says. Chip Balduf of Team One Electrical Services reports his company is installing a lot of LED recessed lighting, ceiling fans without light kits, and dimming control and zone lighting to enhance light layering. Regarding materials, industry watchers report two looks are quite hot at the moment—beaded fixtures and shade-on-shade, according to Stansell Dye of Ferguson Kitchen, Bath & Lighting Showroom. “We’re seeing a trend in every area of design toward gold and rose gold,” says Oakley, “but this definitely isn’t taking over in the way one might think. I think people are afraid of things that are too trendy. No one wants to invest in a home full of current styles only to find themselves starting over in a couple of years when those trends change. “We’re mixing in a tasteful amount of gold in most designs, but supplementing that with more transitional styles using black and the always-popular oil rubbed bronze. I will say that polished nickel is taking a back seat for the time being,” Oakley reports. 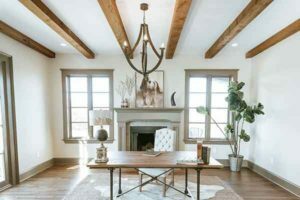 “It’s a great time for designers,” says Jane Stinson of Crye-Leike Realty, “because the lighting for homes can really set the ambiance of the space. What is so great about most of the trends today is that they reflect back on history and will remain timeless.” She adds that “matchy-matchy” looks are not in fashion and that mixing finishes and materials is the way to create interest in a space. Oakley suggests that with a little encouragement most of her clients are open to mixing finishes throughout the house. “I think people have begun to notice that by mixing finishes and blending styles—when done well—their home has a more personal and unique feeling of the exclusive. “If you walk into a home and all of the light fixtures are coordinating—as well as cabinet hardware, plumbing fixtures, and so forth—it feels like someone chose a standard package. 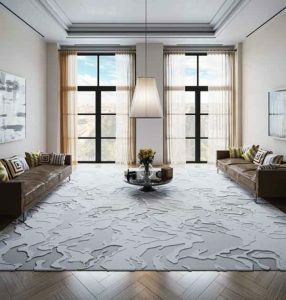 Homeowners today want a space that reflects who they are, not a cookie cutter setting,” Oakley concludes. Team one did a super job for us. I highly recommend them.